If you’ve ever done a craft project with glitter, you know that it gets EVERYWHERE. It’s impossible to open a new jar of glitter without finding it all over your hands and face and carpet the next day. It doesn’t matter how much you try to clean it all up. That stuff never goes away. The same could be said for gossip. When you gossip, you talk about other people and share stories about them that may not be entirely true. Gossiping words get everywhere and never really go away. The person who was the target of the rumor will remember those words forever. And many times, those words leave the person feeling hurt and sad longer than you know. The next time you want to say something about someone, think first. Are my words true? Are they kind? Do they honor God? If not, you shouldn’t say them. Even if you’re telling a trusted friend, you never know where your words will end up. And once it’s out, there’s no taking it back. Instead of opening a jar of gossip glitter, open the sugar for these glittery cake pops! Once they’re made, attach a card with kind words and give them to your friends. After all, sharing encouragement and baked treats is always a better idea than sharing gossip. 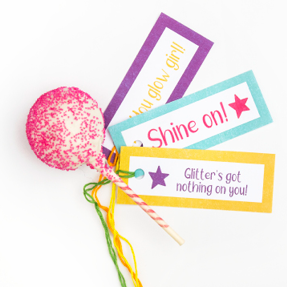 Be sure to download our encouraging gift tags to put on your cake pops! *Get a grown-up to help with this part! Mix sugar with food coloring in a bowl. You may need to add a little water if the food coloring doesn’t mix well. Spread sugar on parchment paper and place on a baking sheet. Put the sheet in the oven for 5-10 minutes. Remove and let the sugar cool. Once it’s cool, crumble and shake the sugar off the parchment paper and into a bowl. Set aside. Cut paper straws in half and cut small slits in the bottom of each bump of the egg carton. Ask a grown-up to help. Put 1 cup (235 mL) of white chocolate chips in a bowl and microwave for 30 seconds on high. Take out and stir with a spatula, then put back in the microwave for 30 seconds. Take out and stir again. If the chips still aren’t melted, microwave them for 10 seconds at a time, stirring at the end of every 10 seconds, until they’re melted. Carefully dip one end of a straw into the chocolate and let the extra chocolate drip off. Put a donut hole on the chocolate end of the straw, and place it upright in one of the slits you made in the egg carton. Repeat with the rest of the straws and donut holes. Once all the donut holes have been securely put on each straw and set in the egg carton, put the carton in the fridge for 2-3 hours. The chocolate will harden and make sure your donut hole stays on the straw. Just before you take the cake pops out of the fridge, put the rest of your chocolate chips in a bowl and heat them in the microwave. Follow the same process you did in step 2. Carefully take your cake pops out of the fridge and dip them in the melted chocolate. Spin once to make sure the cake pop is coated in chocolate, and then hold it above the bowl so the extra chocolate can drip off. Once the chocolate has dried a little, roll the cake pop in your edible glitter. Use your fingers to press and mold the glitter to the chocolate. When it’s covered, put the cake pop back in the egg carton stand and take out the next one. Repeat for the rest of your cake pops. Put finished cake pops in the fridge for another 2-3 hours.